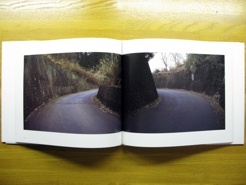 TOSEI-SHA PUBLICATIONS Katsuhito NAKAZATO "R"
In this work, Nakazato Kazuhito creates a series of diptychs taken on different roads throughout Japan. Although each half of the diptychs are taken in different locations, the two photographs form a symmetrical pattern, with the left hand side curving towards the right, and the right towards the left. The result is that we always see two roads curving off into the distance in front of us, as if we were standing at a fork in the road. 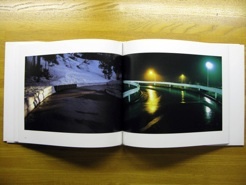 Sometimes, the two photos correspond to each other, for example a spread with a snowy road photographed outside and the inside of a tunnel which is also full of snow. The blue tint of the outside photograph and the orange tint of the tunnel make the images look disparate, but looking closer we can see that they are actually quite similar. 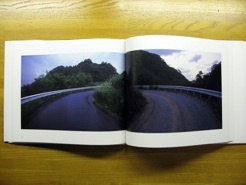 Nakazato shows such roads, always unpopulated by cars and usually taken in the countryside.